I am very happy to announce the arrival of the much anticipated wedding book! I have heard your pleas for a book that is timeless, elegant, and versatile. So, keeping with my signature design style I have created something that is clean and simple with a splash of defining detail that will undoubtedly impress your clients. 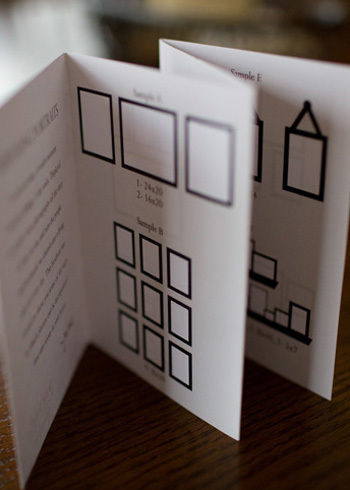 This 30-page 10x10 book design is saved in full layers to give you complete control over the final layout. The color of the design details can be changed with the click of a button and text can be edited or removed to taste. 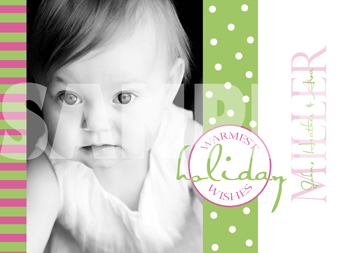 My 2008 Holiday Card samples are trickling in and I thought I would share a few of them with you. I've received several requests from people wanting to see what these look like as press-printed cards so I hope this helps. 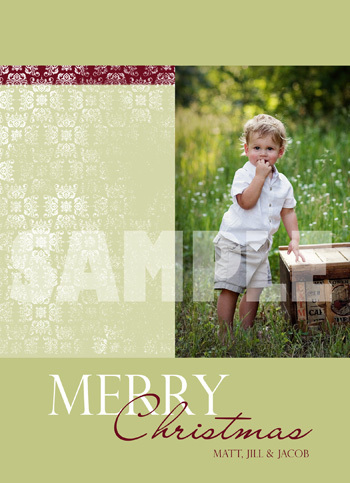 I'll continue to add images as the samples arrive here at the studio. Thank you all again for your enthusiasm over the cards! I also wanted to take a second and show a few examples of what you can do with my templates. 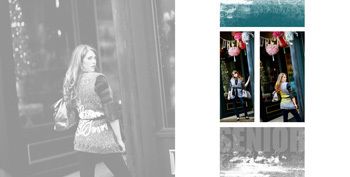 Because the templates are created with color fill layers you can easily change the colors to suit your clients taste. 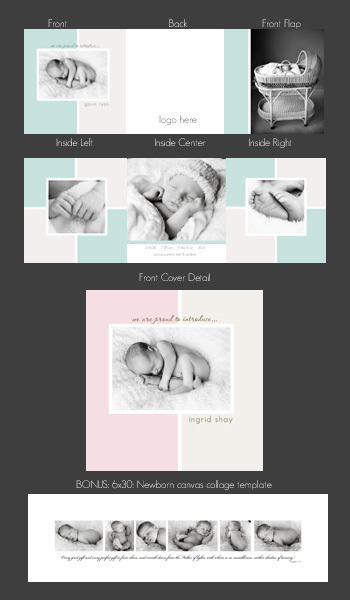 Below are a few samples of a few of the templates made up with different color combinations. It's hard to believe that the Holiday season is right around the corner and with that has come requests for another round of Holiday cards. I must say that this is something I'm beginning to look forward to each and every year and I'm excited to announce the launch of 4 new sets! Keeping with tradition, I've created a variety of templates to fit with my design motto, "A little bit of everything, something for everyone." Whether it's clean and simple, bright and cheery, or traditional...there is truly something for everyone in each of my template sets. This year I'm trying something new in that most of the designs in the set come with at least one additional layout option. And as always, the templates are saved as layered .psd files complete with color fill layers so background colors and brush colors can be changed with a click of the mouse. 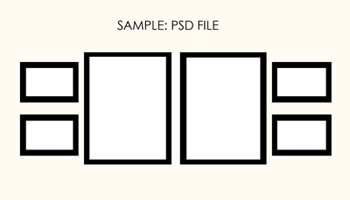 The templates also include easy-to-use clipping masks for inserting the photos. 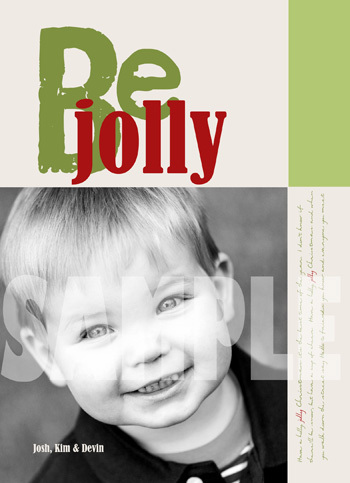 Templates may be printed as 5x7 standard photo cards or double-sided press printed cards. Three of the designs may be printed as 5x7 folded cards (see Cards "D", "E" & "F"...front, inside spread, and backs are included). 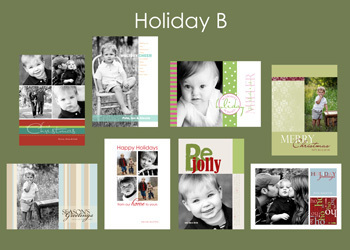 Templates are designed to print as 5x7 photo cards or 5x7 double-sided press print cards. 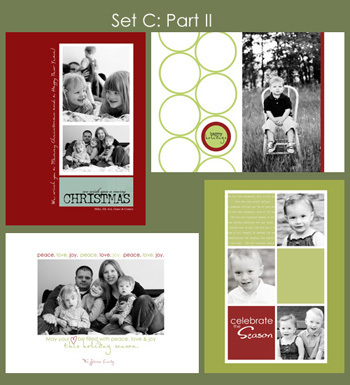 This set also includes 1-5x5 tri-fold layout and 2-5x7 folded card layouts. 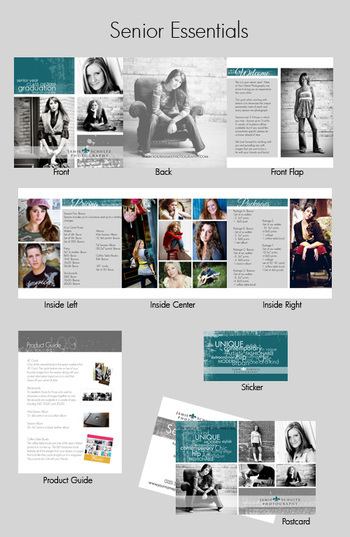 7 designs with a variety of layout options for a total of 14 card templates. 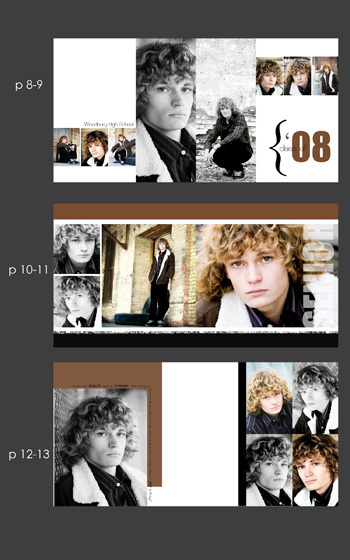 Templates are designed to print as 5x7 standard photo cards or double-sided 5x7 press printed cards. There are 5 folded card options included in this set. 8 designs with a variety of layout options for each design for a total of 16 designs. 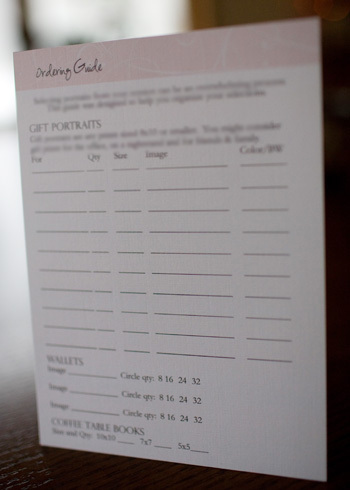 Templates are sized to print as 5x7 standard photo cards or press printed cards. 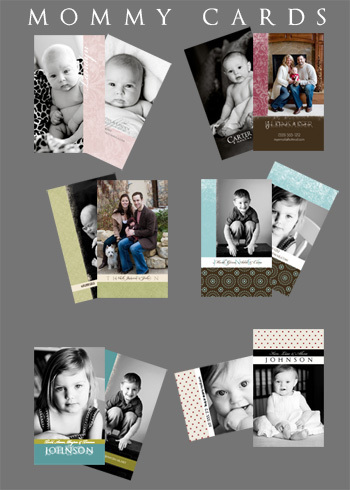 This set also includes 1 5x5 tri-fold and 2 5x7 fold open cards. These templates are for use with Photoshop. No refunds will be given once templates are sent. Design elements MAY NOT be transferred for use on another project. Doing so will result in legal action. I am proud to announce the arrival of my new birth announcement line called "Welcome Baby". This collection includes 8-fully layered psd files complete with easy to change color layers. 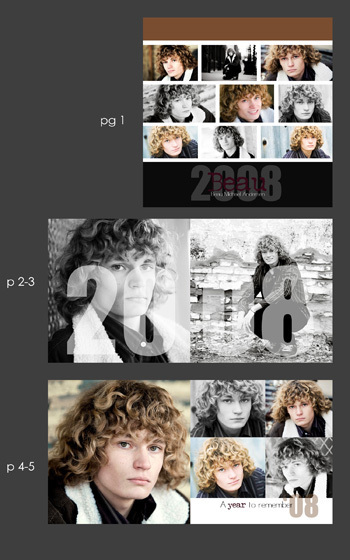 Each design comes as both a boy and girl version and several of the cards have a variety of photo layouts (1-image, 2-image, 4-image options) so there is a total of 26 card templates in the set. 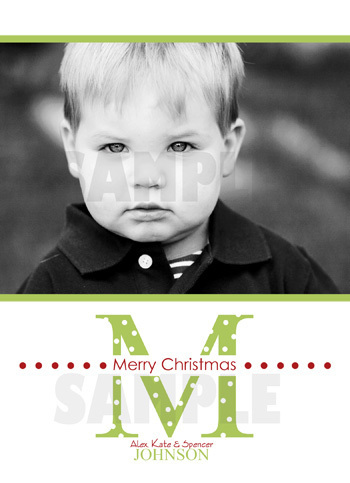 The templates are sized to print as 5x7 press print cards, but may also be produced as 5x7 standard prints. There is also one 5x5 tri-fold card included in the set. 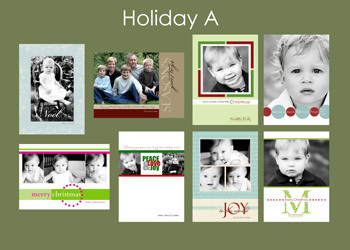 Several cards created with different photo layout options (1-image, 2-image, 3-image, 4-image options) for a total of 26 templates in the set. Photography is an art-based industy so it seems fitting that we provide our clients with products that reflect our artistic vision and style. All of the items included in this set are fully customizeable including background, accent, and brush colors. All text is included. So many of you have written asking for a new book to show your 2009 seniors, so without further ado...I announce the 2009 Senior Book! This 20-page 10x10 book template was created using color fill layers so you can change the colors with two clicks of the mouse. All pages are saved as layered psd files so text and elements can be added or removed as needed. A font list complete with links is included with the templates. The books were created according to Asuka Book's guidelines, but instructions on how to print through labs requiring single-page uploads such as WHCC are included. So...you're trying to reach the senior market but the process of coming up with an informational packet is simply overwhelming. Never fear!! All the goods you need to reach the 2009 senior class is right here. The Senior Essential set includes your Informational tri-fold complete with a welcome letter, pricing, and package information along with a 5x7 product guide featuring all the hot items you have available for purchase. Slip these two informational pieces into a metallic Envelopment and seal with a sticker or ribbon and you're set! Also included in the Senior Essentials is a 4x6 double-sided postcard and a 2x3.5 inch sticker you can put on your bags and boxes. But, these don't match my "brand"?! No worries! Everything on these pieces can be easily customized. The "color blocks" (teal and grey boxes on all of the products) were created using color fill layers. Simple click on the color layer in the layers palette, select a color to match your brand and viola! 1- 5x5 Informational Tri-Fold including text. As I prep for the upcoming 2009 Senior season, I knew a new batch of 411 cards and rep cards were a must. The 411 cards were a huge hit with my seniors last year and several seniors who have already booked for this year have asked to make sure these would still be available. I took it as a sign that the 411 cards are here to stay...for a while anyway. Anyone not familiar with 411 cards... they are quickly becoming "THE thing" to pass out to friends. The cards contain any contact info for the senior (cell phone number, e-mail, facebook address, etc...). Also included in this set are 2 Rep cards. Rep cards are generally used to spread the word about your business. Simply insert an image of a senior on the front and add your studio information and any special offers you might have on the back. Viola! Now your seniors can do some advertising for you! They are designed as double-sided 2x3.5 inch cards. You can print them through any lab who offers small card press print such as WHCC. The finish options are endless, but I must say that pearl and linen are my personal fave! **PLEASE NOTE: THE "La Petit Collection" is not available for sale to anyone within 100 miles of the Twin Cities, MN metro area. Spring is just around the corner which means graduation party season is soon to be in full-swing. I've created an assortment of graduation announcements for you to offer your clients who are looking for something slightly different than the standard "ho-hum" invitations. As always, I tried to create "a little bit of everything, something for everyone". Whether your client is looking for something elegant or edgey...with these templates you will be able to offer them a product perfectly suited for them. 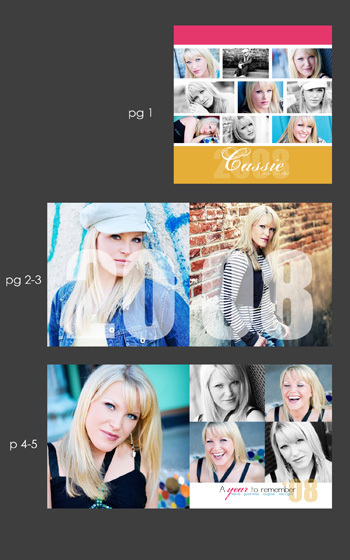 The template set includes 10-psd files sized to print as 5x7 press-printed or standard photo cards. All templates are saved in layers so you can easily change the text. Colors may be changed on some of the cards with a simple click of your mouse. All templates are created using clipping masks so inserting images into the templates is a breeze. Detailed instructions on using the templates will be provided. Well...I couldn't resist any longer. 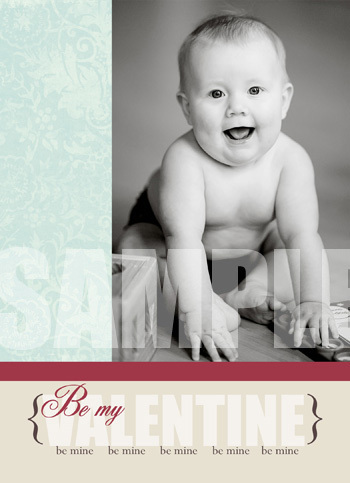 After countless e-mails from people requesting Valentine's templates I just had to give in. 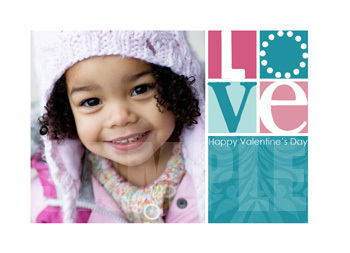 This template set includes 5- 5x7 Valentine templates saved in layers so they are completely customizeable. All templates are created using clipping masks which means you simply drag your photo onto the card, re-size the image to fit, and viola...you are ready to print. The cards are sized to print as press print or as standard photo cards. The Valentine's Set is $35.00. As 2007 came to a close, I took some time to reflect on my photography business and a few of the elements that helped me grow my business to where it is today. Two of the most essential elements added in the past year were my wall display accordian brochure and an ordering guide. These items were instrumental in the ordering process as it helped my clients organize their order as well as visualize various wall displays for their home. The ordering guide and the wall display brochure were so successful for me and I thought others might find them useful as well. 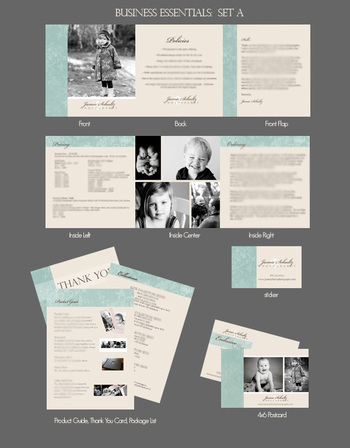 The "Ordering Essentials Set" is $55.00 and includes two psd files including an ordering guide which is a double-sided 5x7 divided into categories that will help clients organize their portrait order and simplify the ordering process. 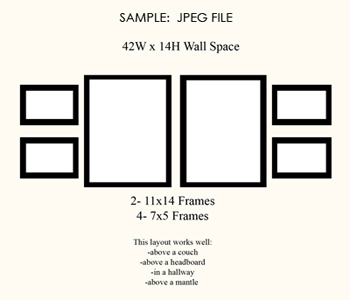 The set also includes an 8-page psd file 4x5.5 inch accordian fold brochure featuring 12 wall display samples (a perfect accompaniment to my wall display collection). The templates are saved in layers complete with color fill layers so you can change the colors to match your brand with the click of a button. Simply change the colors and add your logo and the templates are ready for print. All text is included with the templates. Templates and elements within the template are copyrighted and may not be re-sold! 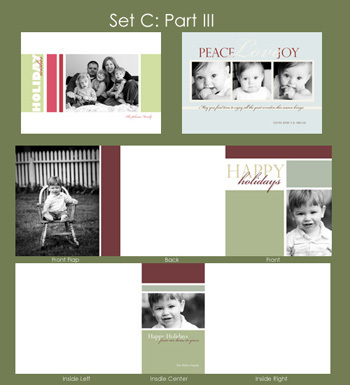 I had requests for more, more, more templates...so, without further ado I announce the launch of Set C of my 2007 Holiday Collection. This set includes 8-layered psd files which means that all text is completely customizeable. 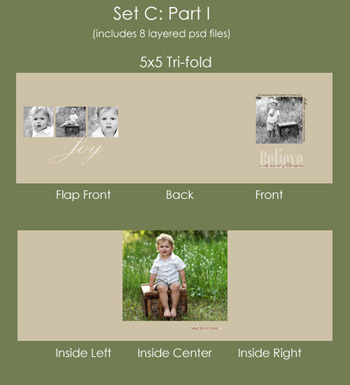 There are 2 5x5 tri-folds included with this set along with 6 5x7 cards. All templates were created using clipping masks to make inserting images a breeze. Thank you all for the overwhelming response to the first two sets!! Set C is $55.00 USD. No refunds will be given after the file has been sent. Templates and elements within the template are copyrighted and may not be re-sold! Templates are for individual client sale only. First of all, let me start by saying thank you to all of you who inquired about my 2007 Holiday Card Collection. I was overwhelmed by the number of people who were patiently waiting for these to launch. 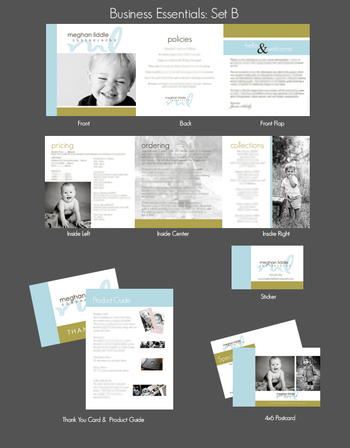 Keeping with my "something for everyone" motto, I have created a variety of templates to suit clients of all tastes. Whether it's clean and simple, bright and cheery, or traditional...there is truly something for everyone in each of my template sets. Your clients are sure to find just what they are looking for! 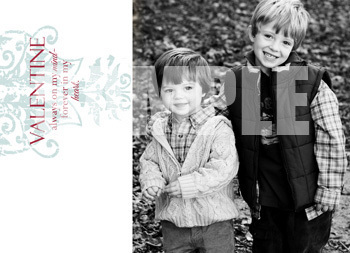 I always do my best to use easy to find fonts for the family names included in my cards. However, you may need to substitute fonts if you are unable to locate particular fonts. 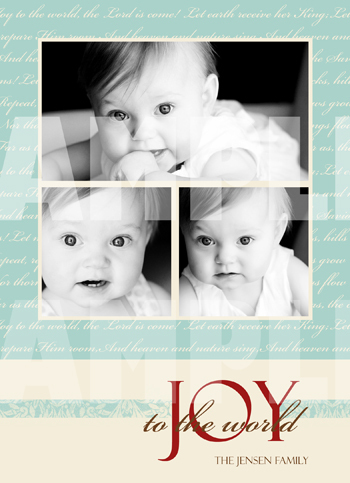 Each set includes 8 layered 5x7 psd files. No refunds will be given once templates are sent out. Templates and elements within the template are copyrighted and may not be re-sold. Templates are for individual client sale only. A future bride once asked, "What in the world should I do with all of these engagement pictures?!" Thus, the engagement coffee table book was born. She loved the book so much she decided to use it in place of a traditional signing book at her wedding! This coffee table book is the perfect way for your engagement clients to show off the images from their session. Not only is it a wonderful heirloom, but it also serves as a wonderful display piece at the couple's wedding celebration. 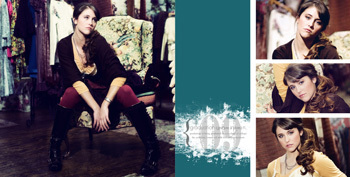 This 20-page 10x10 coffee table style book comes complete with photo clipping masks which means assembling the album will be a breeze. Simply copy and paste the images into the photo area, resize and it's done. All pages are saved in layers so all text, fonts are completely customizeable. Templates and elements within the template are copyrighted and may not be re-sold. Templates are for individual client sale only. Templates are for individual client sale only. Someone once asked me if there was ever a defining turning point in my business. The answer was easy..Yes, as soon as I started offering wall displays to my clients! My sales doubled (even tripled) when I started showing display options. I'm a firm believer that people LOVE the idea of displaying images in their home, but they HATE the process of figuring out how and where to hang them. So, I started doing the work for them by creating various displays for different areas of their home. The newest addition to my design line-up, The Wall Display Collection, is made up of 16 wall display templates suitable for a variety of areas within the home. Each template was created using clipping masks so you simply copy and paste the images into the frames and resize to fit. All the frames, mattes, ledges, and wall colors can be changed with a click of the mouse. 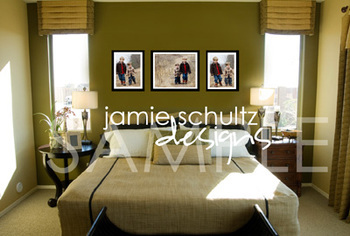 PLUS, I've included 2 sample rooms (living room and bedroom) so you can drag and drop your clients wall display into a room to give them a visual for how their display will look on a wall. This project has been one I spent a great deal of time thinking about. I wanted to create "something for everyone" in a way that would completely streamline the process of showing wall displays to your clients. I think I have done just that with the Wall Display Collection. **PLEASE NOTE: The templates were designed to show you FRAME sizes. 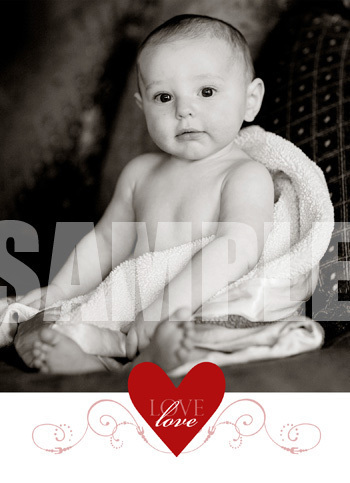 If your clients want their images matted you need to take that into account when they order. For example, if the template says 1- 16x20, 2-11x14's, and 2-8x10's you would like order 1-11x14 print (matted out to fit a 16x20 frame), 2- 8x10's (matted out to 11x14 frames), and 2-5x7's (matted out to 8x10's) OR you can order 2- 8x10 prints non-matted (I do this often...mix and match matted images with non-matted images). 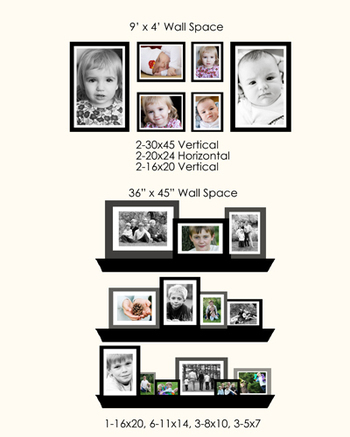 Here is a link to a frame/image size chart I have found to be VERY useful...I take it with me to every ordering session. I am very happy to announce my newest coffee table books designed for Seniors! The templates include 2- 10x10 20 page book templates...one for girls, one for boys. All pages were created using clipping masks which means creating the book is as simple as copying and pasting your pictures into the designated photo areas. The books also have color fill layers which allow you to change the colors in a few clicks of your mouse. Just click on the color fill layer, select a color using your eyedropper and viola! 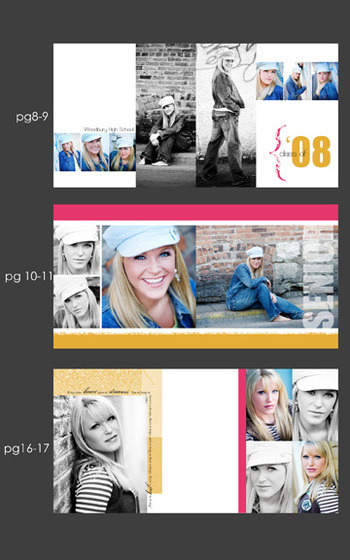 You can choose colors to match the photos or choose from a variety of hip/funky colors I've included with the templates! Coffee table books are a great way to spread word about your business...especially with seniors! There are a lot of labs printing coffee table books now: Asuka, ACI, WHCC, Blurb, Shared Ink...just to name a few!! 1- Color swatch with a variety of hip/trendy colors you can use to accent the pages! I'm also including a few extras with the senior templates. 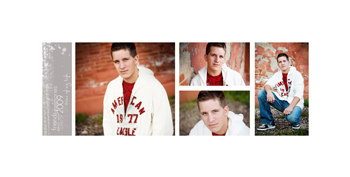 You'll receive a senior rep template and a grad announcement!